I’ve chatted a lot about the challenges with reflections but nobody likes those people who just point out problems without offering any solutions. So in the festive spirit of giving, these are my top 10 ways for getting students engaged in reflection! Pick one, try it and let me know how it goes…. either comment here or tweet me @kirstieparker. How to use it: This is my #1 reflection activity (it’s super jazzy!) 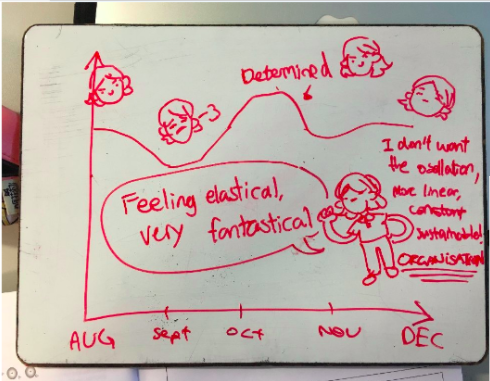 Students individually plot a graph of their feelings on anything (sleep, confidence, stress, happiness…) and how it’s changed over a period of time. Then they discuss their feelings with a partner, what caused the shape of the graph and any changes that they’d like to make. If you’re interested in trying this then check out my template presentation here with sentence starters etc. Cons: Takes 15minutes to do properly – but I promise you won’t regret it!!! How to use it: Best used at the start of a unit. Students to write down 3 words that represent how they are currently feeling about starting the unit, then 3 words to describe how they’d like to feel at the end. Chat in pairs about why they chose their words and what things they need to be aware of in themselves for this unit. Pros: Super short – easily finished in 5-10mins. 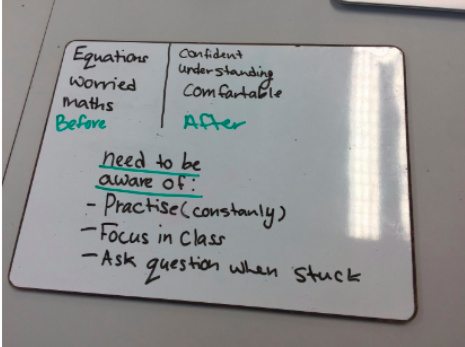 Really good to bring any concerns students have to the surface and tackle them head on! 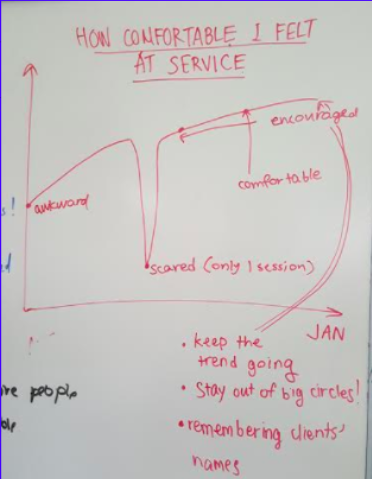 Cons: Missing the analysis phase of “why” students feel that way…. How to use it: Groups of students get massive poster paper and have to write a recipe following the prompts below. Encourage them to put “amounts” for the ingredients to encourage them to think about which things are most important! Then get students to share their recipes with others. Pros: I learned this from the wonderful Doreen Merola, this activity is beautifully creative and great for an end of term reflection (aka when the kids are a little wild but you want them to reflect 🙂 Or you just want to raise the energy! Cons: Will take at least 20mins to do and share ideas with other students – but great as a one-off reflection! Pros: Mega short and you’re kids are guaranteed to love it. You can also 100% set this one for a homework as they don’t need any support. How to use it: Students create a headline to describe the recent test/unit and write a short summary of why they picked it. Pros: Nice short activity that brings awareness to how they are feeling without the pressure to be super formal in their language. Cons: Just focused on awareness and less so on what caused the feelings and how they could change that in the future. How to use it: Students compare the recently completed unit to an animal/cartoon character/song/ tv show…… and watch the magic happen! If B1 was an animal what would it be? Pros: Making it abstract causes the thinking to be deeper and true feelings to be shared. Cons: Missing any chance for students to apply the analysis of the unit to a future situation. How to use it: (This isn’t really an activity…..sorry!) but if you want to do a written reflection then consider giving your students a choice of questions rather than dictating what they have to reflect on. Pros: Gives students more ownership of their reflections and you can mix up the questions that you make mandatory! Cons: Because it’s a “written” reflection you’re quite likely to get responses about “studying harder” or “getting better grades.” Setting good expectations is hard! 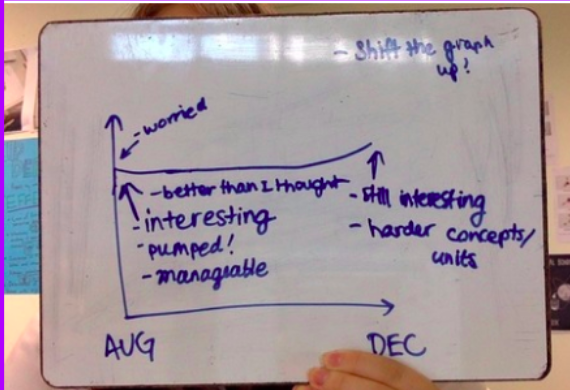 How to use it: Students sketch out a set of thermometers with skills or qualities underneath them. For each skill they have to colour in where they currently rate themselves on the scale. They then have a conversation with their partner about why they selected the levels and which skill they want to work on most. Cons: Does work at the end of collaboration pieces, but try to make sure they have another collaboration piece coming up soon so that they can put the reflection into practice. 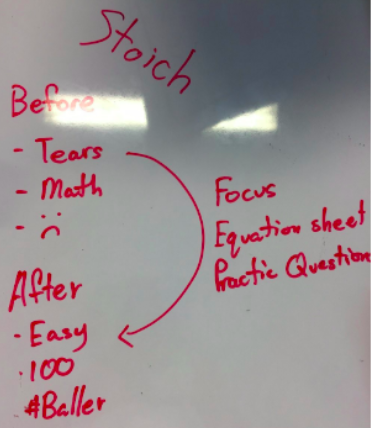 Pros: Good for when you think students are feeling demotivated. Focuses on the desired goals before thinking about the barriers and possible solutions (students often jump straight to solutions…) Super collaborative too! Cons: Will take a good 10-15mins to do properly. How to use it: Again not really an activity (but 10 was a wonderfully round number…) this completely changed my approach to reflections – thank you Cognitive Coaching! If you are doing some of the more collaborative reflection pieces then it can be difficult to record the conversation. After any of these activities ask students to write a quick summary of “how was this conversation helpful to you?” and you’ll be amazed by how well they articulate their responses! Pros: Students are forced to condense the conversation and focus on the learning that they want to take away. I hope you’ve found something here that might be helpful in your classroom.